EnviroLink Forum • View topic - Where is the blue sky? Where is the blue sky? Post subject: Re: Where is the blue sky? Further to the above I grew up on the west coast of coast of Ireland where the winds typically blew from the west. The sky when it was not raining was a brilliant blue, except on the rare occasions when the wind blew from the east and then we got all the industrial smoke and muck from the UK and Europe which resulted in the air gradually getting worse and worse, that was nearly 50 years ago. On the last occasion when I went over too Europe I noticed a continuous haze of pollution that most people seemed to regard as normal. This site will allow you to track the pollution in your area. 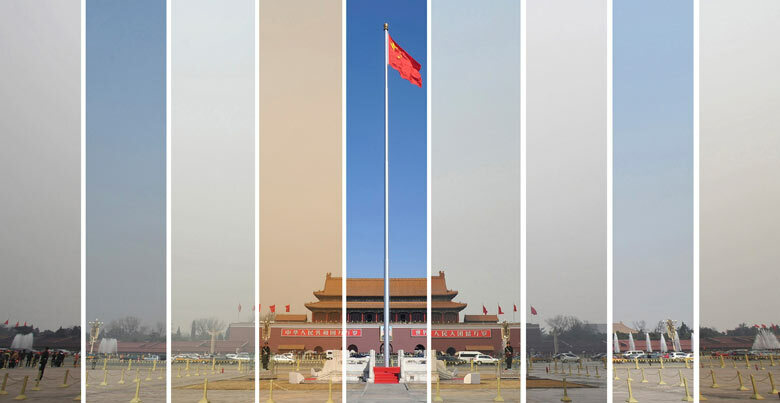 If you think that your area is bad spare a thought for the people who live in Beijing where the the level of pollution is so bad at times that is off the scale of the equipment to measure. It is also worth pointing out that the atmosphere is typically divided up into the boundary layer which is where most of the weather occurs and higher layers. The boundary layer is typically turbulent and provides good mixing of the atmosphere. Above this layer the air is typically stable and vertical mixing is very slow. Con trails normally occur well into the stratosphere (a stable layer) where anything sprayed of small droplet size would take days, and possible weeks to reach the surface. Next time you see a shaft of light notice how slowly the dust descends, and bear in mind that the size of droplets sprayed from a jet aircraft would have to be much smaller just to achieve any appreciable amount of coverage. Are you sure there is an increase or are you now noticing more which causes you to think there is an increase? That is the problem with leaping to a conclusion especially one based on internet blogs by random people. The chemistry, the math, and even the physics do not support the chemtrail theory these folks present you. It also appears that the commercial airline engines trended to the more fuel efficient high bypass ratio turbofan engine in the 1990s which just happens to correlate to the development of the chemtrail theories based on perceived changes in the contrails from these new engines. What I'm seeing is pollution for sure...chemtrail pollution! The who, what and why is debatable at this stage, until we can discover more, but my observation of increased aircraft spraying volumes of material in the sky is not. I see the planes, I see the "stuff", I see the "consequences". And I see the urgent need to do something about it! You see how effective the disinformation campaign is with all the supposedly intelligent people in denial that "chemtrails" even exist. What must be remembered is that the people authorizing and doing this are convinced they are helping to cool the planet and that the few who suffer allergies to it are just the price of continuing to do business as usual. The problem is that if they do the right thing and reduce burning 90%, the economy tanks. Also, if they don't keep doing it, the temperature will go up 5*F immediately with dire consequences. What anthropogenic global warming is already doing is bad enough, even with the albedo change program. They just don't know what else to do to prolong the inevitable when the oil runs out and they can no longer fly the missions, and the tundra and oceanic methane is in a self sustained hyperbolic heating to total turnover stage. There are probably those building underground fortresses and still others planning space flights to escape. Their success would be nice, but doubtful. We just can't see prospective planets good enough, and last underground the length of time to have the biosphere return to benevolent for human life. The powers that be decided long ago to try to hide or just deny the problems of overpopulation and AGW until it was too late to take an easier way out by reducing population in the 1970s and reducing emissions in the early 1990s. Profits and short term thinking prevailed , and ecocide will be the result. Last edited by Johhny Electriglide on Fri Mar 29, 2013 2:53 am, edited 1 time in total. That would relate directly to there not being ANY hard evidence of their existence. Really? Who exactly is authorizing and doing this? Perhaps they can explain how the math fails to cover this supposed cooling program? The figures do not match anything I have ever seen, any references to support them? You do remember the +3*F temperature spikes on the no fly days in 2001, and that atmospheric CO2 has been going up 2 to 3% annually. Plus your plant hardiness zone map, in explanations at the site at the time, explained it was because of a +5*F difference from 1993 to 2012. Last edited by Johhny Electriglide on Sat Mar 30, 2013 2:57 am, edited 4 times in total. You do remember the +3*F temperature spikes on the no fly days in 2001, and that atmospheric CO2 has been going up 2 to 3% annually. Even assuming the increase was 3 degrees rather than the 2 reported, that does not add up to the change indicated even with assuming a direct linear increase tied to CO2 levels. The increase was between the low temperature and the high temperature, or the diurnal variation. It actually got both colder and warmer during that period. Warmer during the day and cooler at night. The potential of condensation trails (contrails) from jet aircraft to affect regional-scale surface temperatures has been debated for years1, 2, 3, but was difficult to verify until an opportunity arose as a result of the three-day grounding of all commercial aircraft in the United States in the aftermath of the terrorist attacks on 11 September 2001. Here we show that there was an anomalous increase in the average diurnal temperature range (that is, the difference between the daytime maximum and night-time minimum temperatures) for the period 11–14 September 2001. Because persisting contrails can reduce the transfer of both incoming solar and outgoing infrared radiation4, 5 and so reduce the daily temperature range, we attribute at least a portion of this anomaly to the absence of contrails over this period. Plus your plant hardiness zone map, in explanations at the site at the time, explained it was because of a +5*F difference from 1993 to 2012. Which is not related to "chemtrails" or lack thereof in any way. What is that supposed to be? An interpretation of how the out of context statements can be pieced together? Yes, it won really impressive awards, such as the official selection of the Paterson Falls Film Festival. Indie films are films first and foremost. The opinions, which are dressed as facts, carry more weight than actual factual information in most of them. The only way some chemtrail conspiracy would make sense is if they were experimenting with sun blocking material in a remote area to test its effect. This would be for a limited time until they completed their studies. There are certainly precedents for conspiracies that are limited in time and space and numbers involved(Limited to need to know participants). Wide ranging long term conspiracies involving lots of participants, at least conscious ones, I know no precedent for. The mother of all conspiracy theories is the devil and his evil minions being behind all bad things that happen. That and variations are a major underpinning of much of religion. Not only that, but the additional weight which would have to be added to each plane involved would make it almost impossible to have anything but a single purpose flight. Even if there were additives to the fuel making it the spraying product, the range would be significantly reduced between a chem and non-chem flight with the same weight of fuel. The combustion of the additive would be problematic as well. The math just does not support such a hyopothesis. That would be quite the conspiracy amongst even the most religious with which I am acquainted, be they muslim, jewish, christian, or otherwise. Accidents and natural disasters tend to be bad things and I never hear any of them attributing them to some devil and/or evil minions. Conspiracies are great entertainment but we need not be making them up. Arguing in absolutes doesn't generally bode well either.